Description: Charles Spurgeon, the "Prince of Preachers," shares from his wealth of knowledge to give you 365 faith-building readings. Through the year, he will teach you to go to God, pleading His promises. 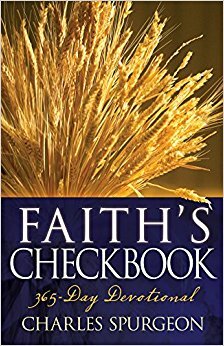 Because God cannot go back on His word, His promises are like checks—you need only to endorse them to receive the gifts they represent. Spurgeon will teach you how to recognize, respond to, and receive the blessings God wants to give you. Your prayer life, your understanding of God, and your relationship with Him will be strengthened as you meditate on God's Word. Begin your days in devotion with Spurgeon, and end your year in prosperity with God.